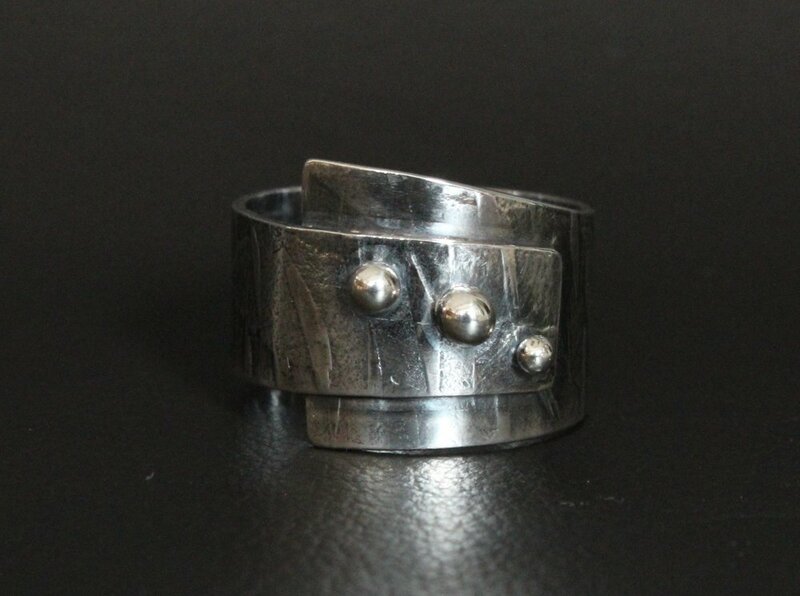 I wanted to create a handmade silver ring design with a bold statement. 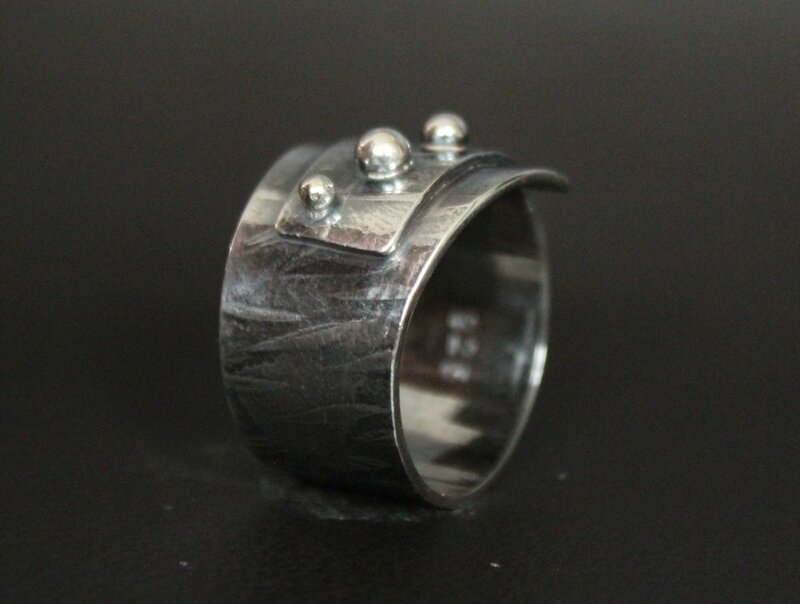 The 'Warrior' ring signifies strength but also resilience. I wanted the wearer to feel strong, empowered and brave. Chunky silver jewellery always does that job for me but I wanted to accentuate this feeling even more! The ring has a substantial weight to it and it is built using a 'wrap-around' style. 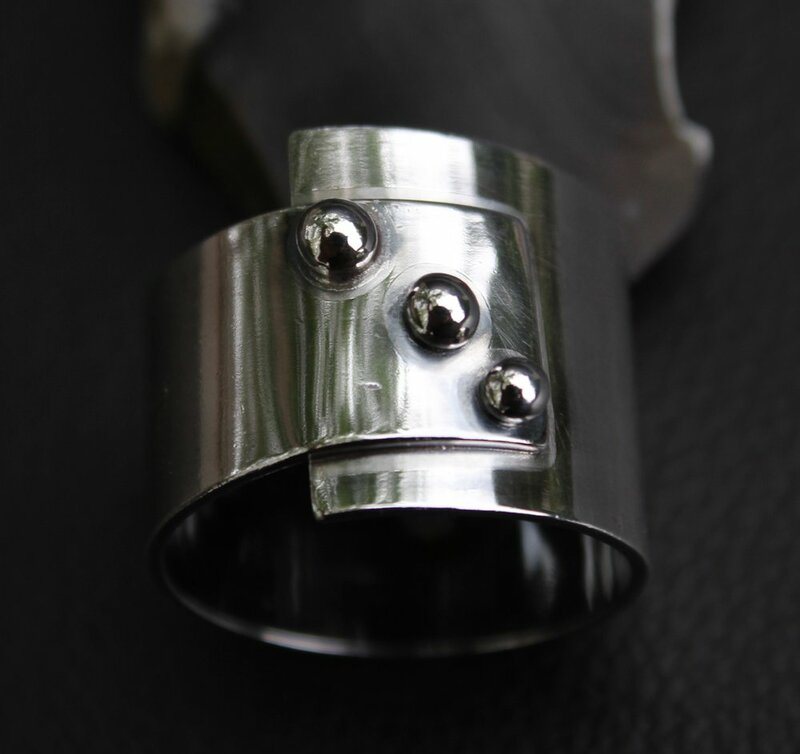 The detail is provided by three sterling silver balls which are attached diagonally to the top of the wrapped part. I think it has the impression of armour in a way, and also reminds me of the Orion constellation in space which has the three bright stabilising stars that form Orion's belt. All of the work I do uses traditional silver-smithing techniques. I use hand tools and tried and tested methods*. These methods are not speedy, (the ring from start to finish took a good few hours,) but I think you do end up with a superior product that looks fabulous and feels fantastic to wear. I just wanted to show some of the stages that take place in order to transform a flat lifeless piece of sterling silver sheet into a finished dynamic piece of jewellery. My boys say that my voice sounds far too relaxing on the tape (! )...so I guess an alternative way you could use the video is to close your eyes, drift off, and have a 6min nap - could be equally therapeutic for you!!! I do love doing this work. Right from the beginning the intrigue starts...I measure my clients fingers and start to understand what they might like, the designing bit is exhilarating as I start to feel the piece come alive in the drawings, and the 'making' part itself is really fulfilling as we get closer and closer to the baby being 'born' as it were. Please pass on my details to anyone who might like a nice bespoke piece made for them, I tend to get work on a 'word of mouth' basis rather than by advertising so any personal referrals are like gold dust to me! Also, don't forget to click through to Facebook and 'like' my page if you would like to see my latest images and projects I have on the go. I value your support immensely. *(Thank you as always to my fabulous tutor Janet Richardson who taught me all the right moves as far as silver is concerned..).